10 Ways To Help Your Girlfriend Cope With Depression — EveryStylishGirl. Through sickness and in health, always have her back. Sisterhood can play a very vital role in helping one another push through or recover from our mental health. 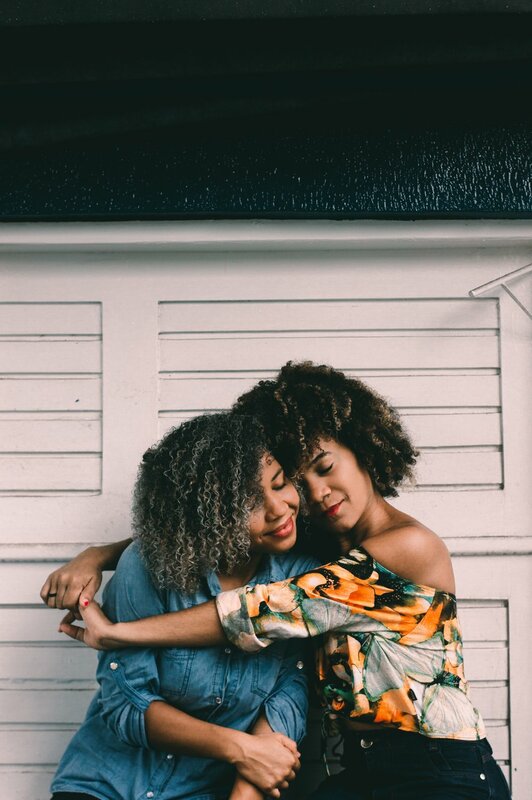 When practicing self-care and learning to love ourselves, it can also include gifting that same love and kindness to the people we hold dearest in our circle. According to the National Institute of Mental Health, about 1 in 5 adults live with a mental illness. More notably, young adults aged 18-25 have the highest prevalence of a mental illness. As mental health issues continue to increase, it is essential that we not only check in on ourselves, but also begin cultivating effective and meaningful ways to guide and support our sisters in need. Igniting conversations about mental health is never an easy thing to do. You may even experience push back from your friends as you try to console them, but ultimately our sisters keep us grounded. Here is a curated list of 10 easeful ways in which you can be a great support system for your girlfriend when she’s hit rock bottom. There will be a moment where you won’t have all the answers or solutions to your friends questions or concerns. The good news is that it is okay to say “I don’t know” or “I don’t have the answer to that.” Instead, you can refer your friend to services or tools that will best help them navigate their situation. The National Alliance on Mental Illness provides a great indepth list of resources that you can keep in your back pocket if needed. Truthfully, it’s the little things that mean the most. Send your girlfriend a quick text saying “Hey, girl I love you!” or even check in to see how their therapy appointment went. Sometimes all it takes to brighten one’s mood is to know that they are cared for. By remembering past conversations or the little details that they mentioned, reaffirms that you are paying attention and actively listening in the moment. For some, this can be your friend’s first time experiencing mental health issues and she may not know where to go or how to begin seeking help. To make this journey less worrisome, one easy way to provide comfort for her is by tagging along with her to her first therapy session or just taking a walk together. Your physical presence can be a great indicator that she does not have to go through this alone. When at her lowest, there may be things she says or does that she don’t truly mean. It may be best to take it with a grain of salt. Be mindful that this can be your friend’s first time opening up about her experiences and it is not your job to define what feelings are right or wrong. Encourage her that it is ok to feel the feels. When venting, most times they just need a soundboard; someone to listen to their stories without interjecting. Being a better listener for your friends is a great way to better understand the true essence of the issues they’re dealing with. In most cases, it’s important to practice selflessness and learn to remove yourself from the situation and become genuinely intrigued or concerned about the health of your sisters. As always, friendships are a two-way street. One great way that you can have your sister’s back is by making sure to hold her accountable for the commitments that she’s made. For example, if she committed to working out once a week, make sure you are there to remind her of her goals and cheer her on for doing what’s best for her health and vice versa. Above all else, knowing when your friends need space is critical. There may be times when you reach out to your friends and do not hear from them for a couple of days – that is ok. Let them tune into their own thoughts and practice being in their own solitude. Taking a break is often times what we all need in the end. It is super critical to understand the heightened level of sensitivity that your friend is experiencing during a tough time. Whether it’s going out to dinner, heading to yoga or having a girls night in, show how much you value spending time with your bestie. One of the simplest things you can do for your friends is check in. Checking in doesn’t have to become a part of your daily routine, but every once in a while or at the end of the week it’s nice to ask “How are you?” A quick FaceTime call is a perfect way to catch each other up on what’s new and find new ways to be a better support system. Physical touch can be one of the most reaffirming ways to showcase your love and care for someone. Hugs let someone know that you validate their feelings and that they are welcomed into your space. For some, hugs can also cause an influx of emotions, but sometimes a good cry or release is just what they need.